NB: With Guardians of the Galaxy Vol. 2 opening in North American theaters tomorrow (they’ve already had it in the UK for the last week, the lucky bastards! ), we felt it was time to dig up this review of an old gem to whet your appetite. When was the first time you remember watching a gang of ragtag misfits flying around trying to save the galaxy from a force intent on utterly destroying its enemies? A lot depends on how old you are, but for me, it was Star Wars back in the summer of 1977. I was seven or eight years old, and it was a magical experience. I have a feeling that this same magical experience is being relived by other 7- or 8- or 9-year-olds all around the world tonight, as they go with mom or dad or older siblings to watch the latest Marvel outing, Guardians of the Galaxy. But you don’t have to be young – it can still be a magical experience at any age, as this 44-year-old will attest. Guardians is the fourth and penultimate movie in Phase Two of the Marvel Cinematic Universe (MCU), and the first to introduce new characters since Captain America: The First Avenger in 2011. These are not, however, your typical super-heroes. 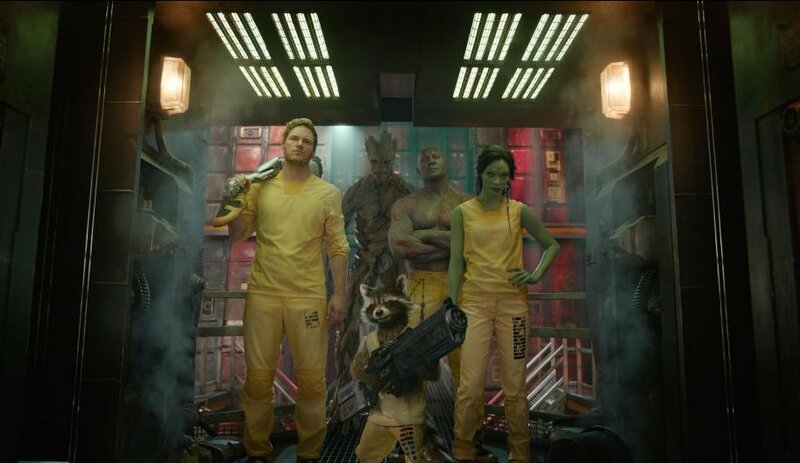 Led ostensibly by the human Peter Quill, aka Star-Lord [Chris Pratt], the Guardians also include: Gamora [Zoe Saldana], adopted daughter of Thanos and a highly skilled assassin; Dax the Destroyer [Dave Bautista], a man bent on revenge for the murders of his wife and daughter; Rocket [voiced by Bradley Cooper], an uplifted raccoon who is a technical whiz; and Groot [voiced by Vin Diesel], a walking talking tree who quietly steals every scene he’s in. Don’t let the avalanche of strange names and alien races put you off; although Guardians is based on a long-running Marvel comic book series, no foreknowledge of the books is necessary to get a great deal of enjoyment out of the film. 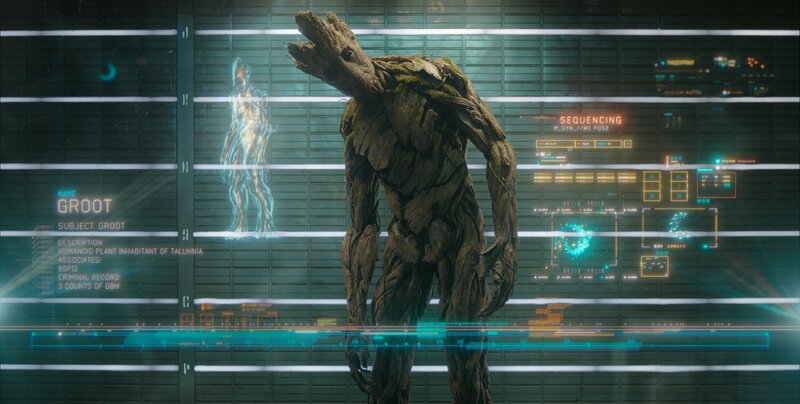 Certainly, there are nods to readers of the books (such as when Quill espies several nodes on Rocket’s back, remnants of his uplift, or when Nebula [Karen Gillan] shows her sibling rivalry with Gamora – a rivalry only alluded to briefly, but present in every scene between them), but there is nothing here that his not accessible to the complete neophyte. The film is a special-effects carnival, with space battles, alien planetscapes, ancient ruins, and enormous space objects (not to give anything away, but just wait until you see the space mine the Guardians travel to). The cool thing is, the vast majority of the work was done by the actors and their stunt doubles. While Rocket and Groot are CGI, they never detract from the excellent stunt work and fight scenes, especially those involving Gamora and Drax. Plot-wise, the stakes couldn’t be higher, and although none of the Guardians is super-powered in the traditional Thor/Iron Man/Hulk/Captain America kind of way, they are always capable of utilizing what skills they have to get things done. And even more so than in The Avengers, there is a real sense of team here; if they don’t do it together, it’s not going to get done. The script is brilliantly penned, initially by Nicole Perlman, with additions and changes made by the director, James Gunn. While the subject matter is pretty heavy (the existence of all life as we know it is being threatened), the dialogue is humorous throughout. Running gags abound, such as Drax’s inability to understand metaphor (when Quill runs his finger across his throat, Drax says, “Why would I want to run my finger across his throat?”); Quill’s dismay that no one knows him by his chosen moniker, Star-Lord; and Groot’s single (but not singular – it has tons of meaning, depending on inflection and context) spoken phrase, “I am Groot.” There are a lot of one-off gags as well, such as Quill escaping back to his ship, narrowly avoiding capture, only to find he has a forgotten lover downstairs in his cabin, who is a little surprised to have been so rudely jostled out of bed. There are tons more, but I don’t want to give too much away before you see the film. Marvel Studios is attempting something a little different from the other movies in their MCU. By adding a larger dose of comedy, and by going with less-recognizable characters, they’re taking a risk of sorts; but what we do end up with is a rollicking space adventure, right up there with the Saturday matinees of my youth. I haven’t had this much fun in a movie theater in years. The adventure elements took me right back to Raiders of the Lost Ark (which I saw seven times in the theater); the space adventure was like an adrenaline-filled Star Wars redux; and the humor was like a cross between Galaxy Quest‘s irreverence and Firefly‘s dry wit. Does this make it the perfect movie? Maybe not, but it is the perfect summer film, a blockbusting sci-fi action-comedy that fills a certain niche audiences seem to crave as summer wanes, and a film that is unlikely to disappoint. One word of advice: stay after the credits for the stinger, especially if you are a fan of cheesy science fiction. A fantastic sci-fi action-comedy that had me laughing out loud, while keeping my attention thoroughly rapt by its dramatic story. Excellent acting, especially from a surprising Chris Pratt, who looks very comfortable as a leading man. This one should be the breakout blockbuster of the summer.